At Vinexpo 2011, we awarded three Cognac houses with a prize for the best booth. This was so popular that we were asked to do it again this year, AND to add another award: for Best Bottle Design. We know what huge efforts go into creating new products and communicating the brands. And that’s why the most surprising, beautiful, fun, and well-executed approaches should be put to the fore. Congratulations to those selected houses, who have exceeded our expectations in every way, and who we think deserve a mention of excellence! It’s impossible to have missed this bottle… It lured you in from meters away… It had an intense presence… Almost like a spell was cast on it… The Jade-colored ornamental glass top, which is actually the stopper for the bottle, reminded us of ancient Samurai legends and age-old tradition. There are beautiful drawings carved into the glass, which give the bottle a playful touch, and a hint of the exotic. We were so impressed with how the bottle held Hardy’s entire booth together. It was like a fashion catwalk show: All eyes were glued to this amazing centerpiece. It’s not at all a surprise that Hardy just secured the phrase “Haute Couture in Cognac” for its campaigns. Congratulations, Hardy, for this incredibly success, and for the finesse in creating high-end luxury in a way that makes us want to see more! The silver medal for Best Bottle at Vinexpo 2013 is awarded to the recently redesigned Elegance VSOP Cognac by Camus. We were really into the entire new look for the range (the new XO Elegance is very nice as well), but the VSOP really stood out with its grey/silver look. The bottle has a very subtle edge to it, with the bottleneck slightly curving outwards toward to top. The stopper is made from solid and slightly heavy high-end material, which gives the bottle a sense of luxury. At the same time it’s not kitsch and over the top, which can happen easily with redesigns. Camus managed to perfectly evaluate it’s product range, and develop a bottle that is targeted at confident connoisseurs who don’t need bling bling to recognize the outstanding quality of the cognac inside the bottle. Great job, Camus, on updating your old design and presenting us with this beautiful product! 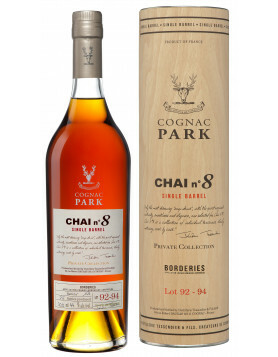 The Bronze award goes to one of the first products we saw during our Vinexpo marathon: Cognac Park’s Chai no 8 Single Barrel, which comes in an edition of only 535, and is a Borderies cognac. We loved the rustic chic of this bottle, and the touch of artisanal production that it communicates. The wooden box the bottle comes in is similarly elegant and cool – we can just picture it in a Brooklyn loft or a penthouse pad in Hong Kong looking extremely authentic. 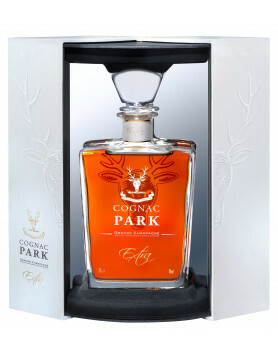 Well done Cognac Park – and of course those responsible at Tessendier & Fils – for doing a great job at creating a bottle targeted at young cognac lovers with a sense of cosmopolitan style. This year, the Cognac-Expert gold medal for best booth goes to Cognac Deau! Anyone who was at Vinexpo will agree that this is not a difficult decision to make… The booth radiated confidence, with its contemporary elegant design and selection of products. The team created a professional and at the same time personal vibe, which made the booth feel extremely professional and relaxed at the same time. Considering that this revamped brand is only a couple of years old at this point, Deau delivers a solid statement of maturity and character. It takes vision to do this well. And we feel there is a lot of creative vision, coupled with a profound understanding of what is important when creating a new Cognac brand. The design of the booth plays with exclusivity and celebrity, and with a certain touch of voyeurism. There are parts where passerby’s can catch glimpses of people inside, and of the bottles that are presented in black frames and softly spot lit. The semi-permeable black screens that surround the booth reference Japanese architecture and minimalist design. This thoughtful modern approach in combination with the extremely effective design of the Deau bottles, simply makes this booth unbeatable in terms of style and coherence. We love it. Congratulations Deau! HINE is getting a hell of attention these days, with their 250th anniversary. But it’s worth mentioning them again, because this cognac house just always gets it right! This time, HINE landed our Silver award for best booth, because you simply could not walk past this stand without being impressed. What they did was blow up an enormous image of the cognac house in Jarnac, and wrap it around the stand although it was physically standing in the middle of Vinexpo. They literally relocated the beautiful old HINE building to create a striking contrast to the entirely anonymous nature of a convention hall (which could basically be anywhere in the world). 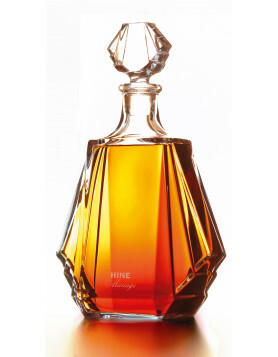 HINE managed – once again – to place emphasis on its sense of tradition, elegance, and class, keeping the interior of the booth in shades of red, selecting only a very small number of products, and of course, including a framed portrait of the Queen of England and Thomas Hine, the alleged spy and smuggler who founded the legendary cognac house. Happy Birthday HINE, and congrats on this prize and an outstanding track record. To be entirely honest, we hadn’t paid close attention to the house of Laclie, with its brand Cognac Leopold Raffin. What we did remember however, was that their internet presence really stands out in comparison to most other cognac houses. On the homepage, you see a pair of long, elegant, high-heeled lady’s legs, lounged in a modern stylish interior. Laclie’s booth at Vinexpo delivered exactly this feel, which is why we believe that it was amongst the best stands at the fair. In fact, the lounge like atmosphere reminded us of a chill-out zone at a nightclub rather than at a brightly lit, badly aired, noisy convention center. There was funky music playing, and the stand was held in black floral wallpaper and pink spot lit textile elements. If you enjoy dark suave hotel bars, this would have been totally your thing! A bar was placed in the center of the stand, with a cool looking bartender serving guests whatever they wanted to drink. Well done, Laclie, on a smart look and a consistent brand identity. Thanks you for all the ones who couldn’t go there! The diary was awesome.